With Easter just a couple of weeks away, bunnies are taking over our house. I made paper roll bunnies, a bunny shaped Easter basket and now some colorful bunnies on a stick. 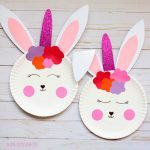 This cardboard bunny craft can also be made out of card stock paper but because I love recycled crafts, I chose to turn an old box into these adorable bunnies. My kiddos woke up to these adorable bunnies this past Friday morning and they were so excited that they took their new toys to preschool to show them off to their friends and teachers. 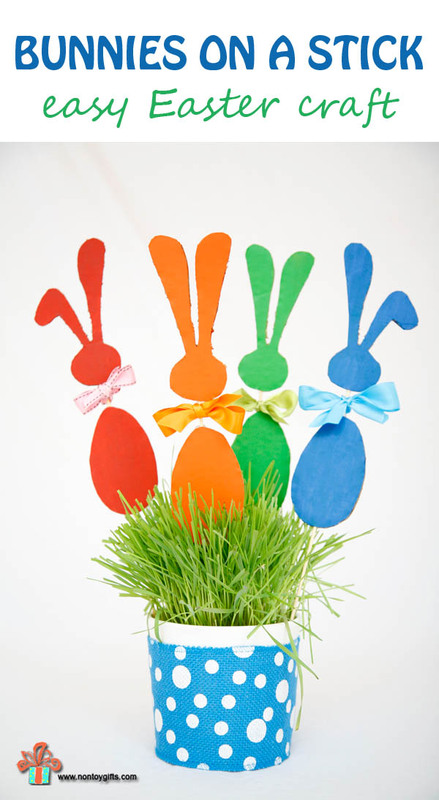 If the bunnies survive my boys’ play, I’ll use them as Easter decoration. To make these bunnies, you can use the template at the end of the post. If you decide to make them out of cardboard, you will need a craft knife for the cutting and in this case, an adult needs to do it. Your child can paint the bunnies and slide them through the sticks. 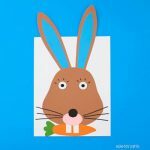 In case you decide to go with card stock paper, your little one can trace the patterns and cut them out and then glue them together on sticks. 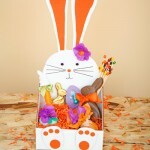 For more Easter or spring ideas, check out this collection of 48 bunny crafts for kids. Step 1. 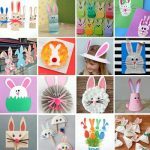 Download the free bunny template from the end of the post, trace the patterns on cardboard and cut them out. Cardboard is very sturdy and you will need to use a craft knife for this step. Because craft knifes are sharp, an adult will have to do the cutting. 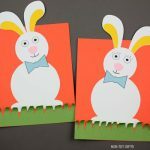 You can also make the bunnies from cardstock paper and in this case, kids can trace and cut out the bunnies. Step 2. Paint your bunnies any color you want. The advantage of using cardstock paper is that you can chose any color paper and skip this step. Step 3. Thread the bunnies on the bamboo skewers and secure them at the back with hot glue. Young kids will be able to use low temp glue or if you don’t have one, an adult should handle the hot glue gun. 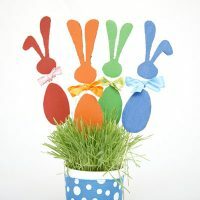 If you’re making the bunnies from cardstock paper, you will need to glue the bunnies to the bamboo skewers. Step 4. Use matching ribbons and tie them up in small bows between the head and body part. Glue the bows at the back so it stays in place. 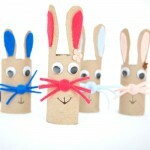 Make colorful cardboard bunnies to use as spring or Easter decoration. Step 1. 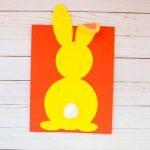 Download the free bunny template, trace the patterns on cardboard and cut them out. Cardboard is very sturdy and you will need to use a craft knife for this step. Because craft knifes are sharp, an adult will have to do the cutting. 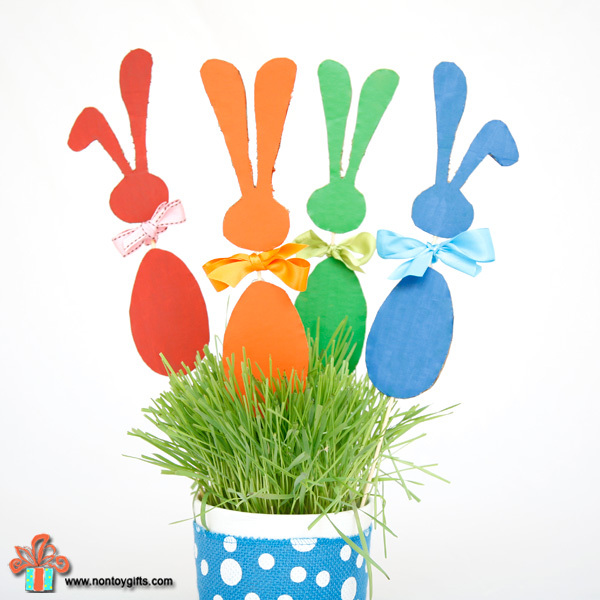 You can also make the bunnies from cardstock paper and in this case, kids can trace and cut out the bunnies. Step 2. Paint your bunnies any color you want. Step 3. 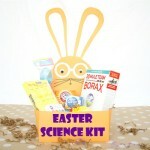 Thread the bunnies on the bamboo skewers and secure them at the back using hot glue. Young kids will be able to use low temp glue or if you don't have one, an adult should handle the hot glue gun. 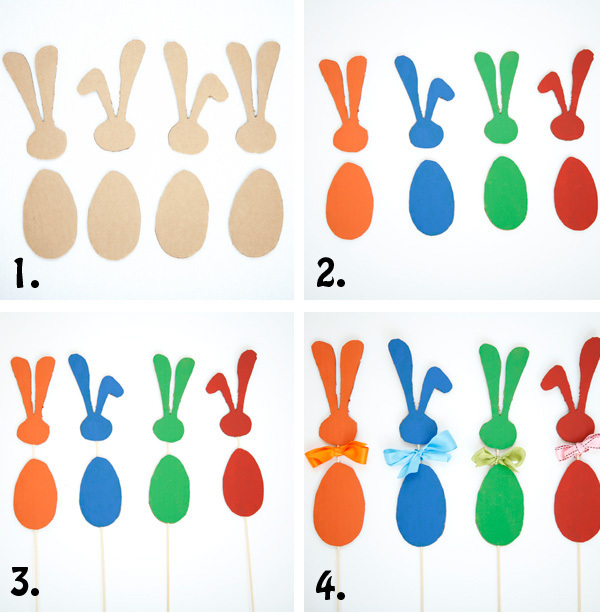 If you're making the bunnies from cardstock paper, you will need to glue the bunnies to the bamboo skewers.